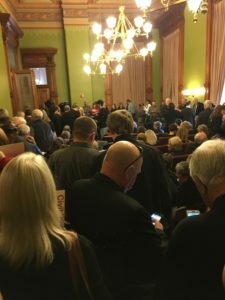 A large and vocal crowd turned out today for a statehouse hearing on a so-called “personhood” bill. Senator Jason Schultz, a Republican from Schleswig, opened the meeting by reading from the legislation. “The sovereign state of Iowa recognizes that life is valued and protected from the moment of conception,” Schultz said and the crowd cheered. Critics say the bill would outlaw all abortions, “the pill” and in vitro fertilization. Voters in a few other states have rejected referendums that would have granted “personhood” to a fertilized human embryo, but after 2016 election victories, Republicans in states like Missouri, Montana and Iowa are moving to revive the issue. Advocates of the legislation came from other states to urge Republicans in Iowa to pass the bill. Rebecca Keissling, an attorney from Michigan, said the bill provides an “excellent strategy” to overturn the “Roe v Wade” decision that legalized abortion. “You’re providing the framework to recognize that the unborn child is a person and also to have a public policy that perfers childbirth over abortion,” Keissling said. David Sickelka, the senior pastor of the Urbandale United Church of Christ, is chairperson of the Interfaith Alliance of Iowa and among the opponents who testified against the bill during the hour-long hearing. The bill cleared a senate subcommittee this afternoon and must win passage in a full Senate committee by this Friday to remain eligible for consideration. The measure is co-sponsored by 20 of the Republicans in the Iowa Senate. A bill needs 26 votes to pass the Iowa Senate. The two highest-ranking Republicans in the state senate are not co-sponsoring the bill.